Outdoor Mats Perfect for use in entrance-ways, home front and back doors, production areas, breakrooms, kitchens, vending areas, water fountains, ice machines and garages Outdoor matting is your first line of defense against dirt and moisture. These mats are designed to scrape shoes clean of heavy debris that would otherwise find its way into your home or facility. Protect the longevity of your floors by removing dirt from foot traffic before it even hits the door. Dual-Mat System The best way to keep dirt and moisture from being tracked into your home or building is to use our dual-mat system at every entranceway: an Outdoor Mat to scrape shoes clean and an Indoor Mat to wipe shoes dry. Guardian Clean Step Scraper mats are the first part of this system and when paired with an indoor mat such as a Guardian Ecoguard or Platinum series mat they provide ultimate protection for you home or building. 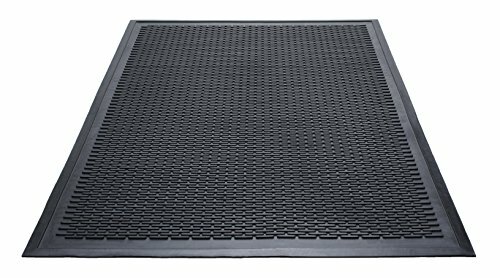 Guardian Clean Step Scraper mats feature superior molded tread that aggressively scrapes shoes clean and traps debris in the base of the mat. It is easy to clean, just turn it over and shake or hose it off. Safety features include a slip resistant base and beveled edges to help prevent slips and falls. Made with natural rubber that is recyclable for reuse of materials. It is certified "High Traction" by the National Floor Safety Institute (NFSI). Warranty Guardian Clean Step Scraper Mats have a Two-year warranty for material and workmanship, with proper use and maintenance. Guardian Floor Protection warrants new products against defects in material and workmanship when used and maintained as instructed. See our website for full details.All trade sizes indicated are approximate sizes, mat sizes are not always an exact measurement. Due to the manufacturing process some shrinkage may occur.